I wanted to write this up and do some research on this topic for all the entrepreneurs recruiting technical talent…outside of Silicon Valley. The start of this article stemmed from a local tech startup in Tampa (finally) being funded with Venture Capital: $2.5 million, in October at their beta release. The company was a social network competing with Facebook, and received a lot of heat in the media about a lack of programming or tech talent in the area. My companies are also located in Tampa, and we’ve felt these kinds of impressions from others as well. Well, there is good news…if you are an entrepreneurial founder, it’s actually easier for you to recruit tech talent outside of Silicon Valley…then it is in Silicon Valley. And alot cheaper. I will explain the data in just a second…. Areas not known as “startup hotbeds” actually did better in hiring technical talent…and they did it faster (yes, places no one has heard of); with Boston coming in next. So if you don’t live in a booming startup area, you should average 0-3 months to recruit your talent. The biggest issue to overcome in these areas, will be adjusting technical talent to early stage risk/ equity positions, because it’s not the norm in other parts. 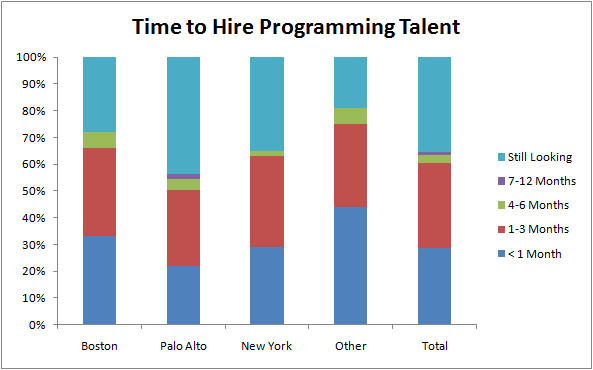 The most competition for entrepreneurs attempting to recruit programming talent? And the place it will take you the longest to get technical talent? Silicon Valley. Half of their companies take over 6 months to recruit technical talent, and a large portion are still looking over a year later. So in conclusion, yes…the money may all be in Silicon Valley. But the talent pool is too narrow. After all, money doesn’t do you any good…without talent. Get out there and network, do some convincing, eliminate early risk by outsourcing to help get your tech talent on board; because the talent really does exist, and you actually do have an advantage as an entrepreneur recruiting tech talent outside of the Valley.